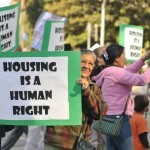 In the United States, there is an overwhelming consensus that we face a severe market failure with regard to housing. 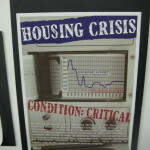 There is also ongoing debate, analysis, and no shortage of opinions on how to address the “housing crisis.” In the midst of all this noise, however, lies a deafening silence on the lack of decent and affordable housing as a profound crisis of human rights. Cities and towns across the country have grown rapidly and redeveloped without ensuring that the process of development protects fundamental human rights. Public housing has been demolished, previously affordable housing has become prohibitively expensive, predatory lending practices have driven countless homeowners into foreclosure, and federal housing assistance programs have been chronically underfunded for decades. In this context, whole communities–mostly poor and working-class–are continuously being displaced from neighborhoods where, in many cases, families have lived for generations. Increasing homelessness, overcrowding, and declining quality of life for millions of families and individuals are all stark reminders of the human costs of the current approach to development. Raquel Rolnik, the UN Special Rapporteur on Adequate Housing, observed these trends in her 2009 official mission to the United States, having previously noted, “The belief that markets will provide adequate housing for all has failed.” Read the Special Rapporteur’s full U.S. report with recommendations and the grassroots report on the U.S. mission, Our Voices Must Be Heard. Lenders filed a record 2.87 million foreclosures in 2010, a figure that is still projected to increase by 20 percent in 2011. While there are approximately 3.5 million homeless people in the United States, the number of vacant homes has reached over 18.5 million. The average time applicants have to wait before they receive housing assistance in the form of Section 8 vouchers or public housing is 4-6 years, which they will receive only if they can fulfill ever-narrowing eligibility requirements.